According to experts, a central air conditioner's performance depends at least as much on how well it's installed and maintained as on the equipment itself -- and in many cases, more so. "Furnaces and air conditioners don't just snap together and plug in, unfortunately," says Bill Brown, an Ohio HVAC contractor in an article at Angie's List. "So, we really are the guys at the end of the manufacturing line; it just so happens to be in your backyard, attic or basement." Because every house and every installation is unique, there really is no uniform way to compare how well central air conditioners perform in the home. Even user reviews are of limited help as poor performance, in many if not most cases, is more likely to be due to poor installation than any fault in the equipment itself. Timothy Kautz at All Systems Mechanical, a California HVAC contractor, takes that one step further, saying "Premature failure of components is almost always the result of improper installation." He adds, "At the end of the day, the most important part isn't the brand you choose, it's doing your research on the contractors you will use to install it." That said, we did find some solid feedback in the form of expert opinions regarding the technology, reliability, and warranty/customer service of specific brands and lines of central air-conditioners, as well as Consumer Reports' owner survey which measures owner satisfaction with central air conditioner brands as a whole. Finding consensus between experts, owners and HVAC contractors is never easy. However, as is the case most years, the Lennox brand is generally -- though not universally -- well regarded. Lennox is among the more reliable central air systems in Consumer Reports' large owner survey, with around 17 percent reporting that their unit required service in its first five years. That's in line with the company's reputation and policies regarding qualified installers. Brown says that the biggest reason why brands like Lennox, Carrier and Trane are considered to be better than others is that those companies are "selective about who they let install their products." But while most contractors put Lennox at the top of their lists of top brands, there are dissenters. All Systems Mechanical, for example, recommends against Lennox based on their experience dealing with the company's customer service and sometimes long delays in getting replacement parts if a repair is required. Be that as it may, Lennox continues to draw strong feedback in many quarters. The Dave Lennox Signature Collection sits atop the Lennox brand's offerings. The Dave Lennox Signature XC25 is the top rated system at All Things HVAC. 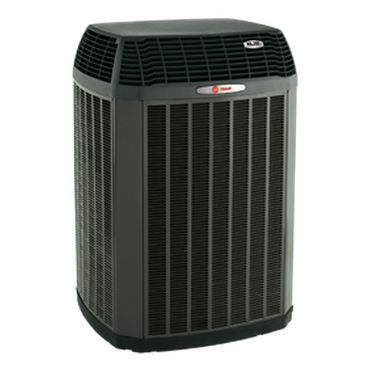 User reviews for central air conditioners need to be taken with a grain of salt as so much depends on the installer, but Lennox's policy of setting high standards for its installers seems to be paying off as the XC25 enjoys a 4.8 star rating at the Lennox web site, based on more than 230 reviews. Benefits start with its efficiency rating of up 26 SEER (depending on unit size) -- that's high enough to cut energy costs by as much 60 percent when replacing an older unit, and high enough for certain models to be included among of the Most Efficient Energy Star qualified products of 2018. Want to save even more on energy costs? The XC25 is SunSource solar-power ready, meaning that in sunny climes and locations, it can directly accept solar panels that can be used to power the air-conditioner, and to supply power to your home when your air-conditioner is off. The brand has a good reputation for reliability, as noted above, but at 10 years, its warranty is a little shorter than some models. According to reviews, the Carrier Infinity 21 24ANB1 is another good choice. It draws good feedback even though it's been eclipsed by other models in terms of absolute efficiency with its 21 SEER rating -- still good enough to be Energy Star qualified, of course, but not high enough to be among the most efficient models for 2018. Like Lennox, this Carrier air conditioner is covered by a 10-year warranty. Reliability is slightly below that of Lennox in the Consumer Reports user survey, with 18 percent needing service in the first five years, but that 1 point difference is too small to be considered meaningful. Though user feedback is slim (as is typically the case with central air conditioner systems), the Carrier Infinity 21 series makes the list of the 10 best central air conditioners at Furnace Compare. HVAC contractors largely like it, too, as it makes the list of top systems at All Things HVAC. Carrier is listed among the top brands for 2018 by All Systems Mechanical, but not in their top tier of brands. The issue is cost, but that aside, Timothy Kautz says "We love Carrier air conditioners and they have a top notch reputation in the industry." When it comes to reliability, Trane is another brand with above average feedback from owners and experts. The Trane XV20i is a modulating central air-conditioner model that runs at low capacity most of the time, increasing in steps as low as one percent as needed to meet demand and to keep temperatures to within a half degree of the thermostat setting. That reduces noise and improves efficiency -- though with efficiencies that top out at 22 SEER you can get central-air systems that are more efficient still. Trane's ComfortLink II communications technology connects the system's components and configures them for best performance, and it allows for remote control of the system via a smartphone app. The warranty is 10 years on everything except the compressor, which is covered for 12 years. It's rated as the second most reliable brand in the Consumer Reports survey. Amana central air conditioners have sometimes received poor ratings for reliability in past surveys by Consumer Reports. But whether it's because of a change in methodology by that publication, or improvements in equipment reliability and/or installer quality by Amana, things seem to be looking up. In the most recent survey, Amana finishes with an estimated breakage rate of 18 percent (within the first five years) -- the same as Carrier, and the gap between it and the very best rated brands is too small to be meaningful, Consumer Report says. Among Amana central air conditioner systems, the Amana ASXC18 is a mid-level model that looks to be a good choice. With a maximum efficiency rating of 19 SEER, it falls toward the bottom of the high-efficiency central air systems we recommend, but most configurations reach the threshold needed to be Energy Star qualified. That's good enough for the editors at All Things HVAC to award it honorable mention status on their list of the top AC systems. It's not as efficient, nor as quiet, as systems rated higher, but it's a reasonable alternative for situations where budgets are tight, and maximum efficiency is not a must. Features include ComfortNet communications compatibility with optional controllers and thermostats to improve efficiency and ease of use. However, the biggest plus is its excellent warranty -- lifetime on the compressor, 10 years on the balance of the system. Keeping in mind our earlier comments regarding user reviews at manufacturer sites, what we see at Amana's site is pretty positive -- a 4.8 star rating after nearly 95 reviews. It also makes the top 10 list for 2018 at Furnace Compare, based on user feedback posted to that site. Are there any central air-conditioner brands to avoid? The short answer to that question is probably no. The Consumer Reports owner survey has a distinct bottom tier of makers that score lower -- between 21 percent and 25 percent of units from these companies need repair in their first five years. However, while the gap between the very best and the very worst brand is large enough to be meaningful, the gaps between most low-scoring makers and those that are mid pack are not. In addition, virtually every brand in the bottom tier has good support elsewhere from both contractors and users. A case in point is Goodman, maker of Amana central air conditioners. Goodman finishes behind Amana in Consumer Reports' ratings (22 percent versus 18 percent need repairs in the first five years), and Mary H.J. Farrell opines that out of all the brands in the survey "Owners of Goodman systems are predicted to be the least satisfied." However, Goodman is recommended by several other experts. At All Systems Mechanical, Goodman is the highest rated brand based on value and reliability. Kautz directly compares the Goodman DSXC18 to the Amana ASXC18 profiled above and finds them to be essentially identical in terms of hardware, features, performance and warranty, though the Goodman system clocks in at a slightly lower price for the equipment. It also shares honorable mention honors with the Amana at All Things HVAC, with both largely sharing the same pluses and minuses. What do owners think? The DSXC18 draws terrific user reviews at Goodman's site, and 99 percent of the more than 80 owners that leave reviews recommend it. It is also the top-rated model at Furnace Compare. To be sure, there are owner complaints about units that failed, but there is also feedback that says that if installed properly, the Goodman central air system will perform well and be reliable. But that's the rub. Furnace Compare's editors note that "Goodman is the brand of choice for contractors trying to provide the lowest cost bid." In light of that, they advise prospective buyers to "Be sure to vet your contractor thoroughly, because a small percentage of these low-priced contractors are not qualified to install these units." And that, as noted elsewhere in this report, is probably the bottom line: Take the time you need to find an experienced, quality installer, and just about any central air conditioner brand should provide excellent performance. What differentiates them is features, efficiency and, of course, price.